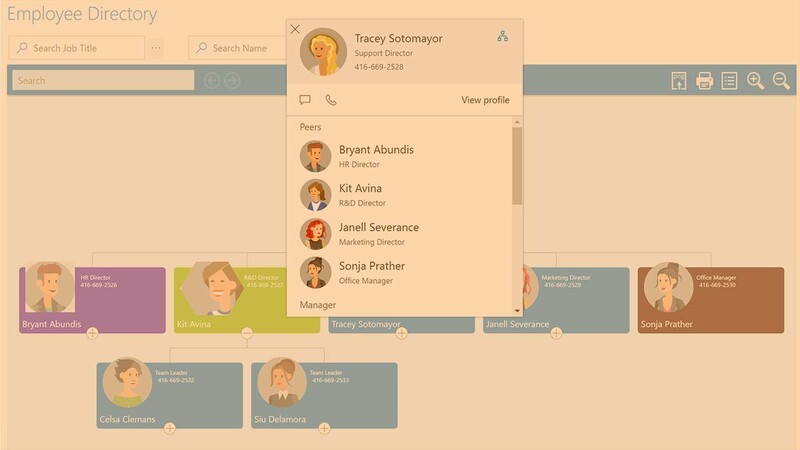 Get the most out of your SharePoint Online organization chart! Replace static organization charts with real time, interactive, user-friendly & highly customizable organization chart software! The Org. Chart app is a SharePoint client-side web part, utilizing the SharePoint Framework (SPFx), displaying organization breakdown structure (OBS). Dramatically Improve Your SharePoint Online Org. Chart! This allows you to easily implement your Org. chart, no matter where your data resides! Do you have hundreds or thousands of employees in your organization? Configure your filters to enable end-users quickly find employees by any property. You can configure horizontal/vertical layout per-employee. This allows you to have full control over the exact layout of the Org. chart: if you have many staff members reporting to the same manager, you can display them vertically and avoid horizontal scrollbars in your chart. The Persona card shows clearly a selected employee’s manager, peers and staff. Easily and quickly highlight your data with icons and fore/back colors, according to various logic conditions. Select how you would like to mark employees as “Assistant” to be displayed in the Org. chart (shape, color). Support for employees that have more than one manager to whom they report. OK, now that you found an employee - what actions can you take? Employee card includes various common actions such as Email and Phone Call, but the really nice thing is that you can add your own custom actions and make the employee card match your exact requirements! Department/Corporate org. chart – especially in large organizations, sometimes it is not that easy to find the right contact. The Org. chart provides a clear view that enables finding the right contact by his name, role, his/her manager etc. Corporate phonebook – many organizations keep employee information in their HR system, which is external to SharePoint, so in this case employees might find themselves having to work with multiple systems just to get that small piece of information about a fellow worker. With the Org. chart web part you can display employee information taken from external system, integrated into your SharePoint portal page. Clear display of hierarchical data – not just for organization hierarchy, but for any other hierarchy which is stored in your excel files or SharePoint lists. The Org. Chart client-side web part is part of the KWizCom Data View Tools package for SharePoint Server/Online.